Sabertooth – Professional Engineering Co., Inc.
Is there a way to easily and safely remove plaster ceilings without the mess and challenge? The new Heavy Duty SaberTooth™ Bolt and Wire Cutter tool was designed to easily cut up to a 1/4″ treaded rod. Unlike cutting down suspended ceiling tiles, removing plaster ceilings is more of a challenge; requiring workers to climb on top of the ceiling to cut wires and because of metal support bars supporting the ceiling, plaster cannot easily fall to the floor. 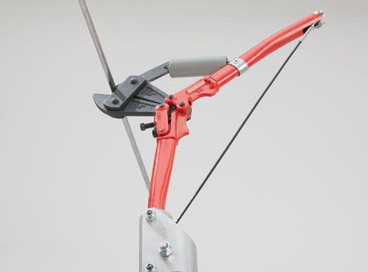 The Sabertooth® Bolt and Wire Cutter cuts Jack Rod or 1/4″ threaded rod used for suspended ceilings, sprinkler pipes, HVAC, cable trays and plumbing, safely up to 7 feet away from the edge of the ceiling opening without climbing on top of it, allowing plaster to simply be pushed down to the floor. With Sabertooth® patented wire feed design to easily guide the bolt or wire at a distance and it’s lightweight yet durable 7 foot fiberglass pole there’s no climbing, and no struggling with metal support bars. Because Sabertooth® Bolt and Wire Cutter is a new product, we would enjoy hearing feedback from professionals in the industry about how they could use this tool. If you’d like to participate – please leave your answer below. This is an anonymous form with an optional field to provide your email address, but a recaptcha box is required to prove you are a real contributor. Please ensure the recaptcha box is checked. How many jobs do you do that deal with plaster ceilings, cable trays, or anything suspended by a wire or threaded rod up to 1/4" ? Would you be interested in being notified when the tool is for sale?